Long before the first purpose-built racing facility was constructed, Kiwi speed freaks competed in hill climbs, on beaches, or on oval horse-racing tracks. Hill climbs and beach races actually held New Zealand–sanctioned championship events. In 1933, the first New Zealand road race was held in Orakei, Auckland, using sections of public road, including Coates Avenue, Reihana Street, and Tautari Street. At the time, these roads were all still gravel and surrounded largely by scrubland. There were no houses. The race was part of a week-long festival called ‘Prosperity Week’, held during the Great Depression to raise public spirits. There were various sporting events, parades, and concerts. The motor race was grandly titled the ‘Prosperity Grand Prix’ (GP), and was a six-lap competition around the Orakei Road course, which measured 2.8km. Eight cars were entered but only six started. One of these was a full-blown Indianapolis racing Miller that had been imported to New Zealand for beach racing. This was expected to be the fastest car, but, designed as it was for Indy, it had poor brakes, and the race was won by Arthur Dexter in a 50hp 1087cc Riley Nine. From humble beginnings, road racing quickly grew in popularity in New Zealand. Street tracks and aerodromes were the only options for the next two decades. With little happening during the hostilities of World War II, momentum began to grow following the war. The first major event was the New Zealand Championship Road Race. It was held in 1949, and run by the Canterbury Car Club. The race was to be run on closed-off sections of public road in Waimairi County, near Harewood, but, as the race drew nearer, the required permit to hold the event had yet to be granted. Just 10 days before the event, a new venue was found, using sections of runway and perimeter roads at the Royal New Zealand Air Force base at Wigram. The Canterbury Car Club ran this event for its first two years, before the newly formed Motor Racing Club took over from 1951. With permission from Lady Wigram herself, the major Wigram race also received a name change — to the Lady Wigram Trophy. Meanwhile, further racing events began to emerge, including the Selwyn Molesworth GP, held at the Ohakea Air Base and run by the Manawatu Car Club. Sections of country road were used for the New Zealand Road Racing Championship, run by the Canterbury Car Club at Mairehau, while, in Dunedin, a temporary wharf track was laid out in 1953 to create the first Dunedin road race. In 1954, the first New Zealand International Grand Prix (NZIGP) was held at Ardmore Airport, run by the Auckland International Grand Prix Association. By 1956, major international motor-racing events were being held at Ardmore (NZIGP), Wigram (Lady Wigram Trophy), Ohakea (now called the ‘Ohakea Trophy’), Dunedin (New Zealand Championship Road Race), Mairehau (South Island Championship Road Race), and Ryal Bush, just north of Invercargill, run by the Southland Sports Car Club. 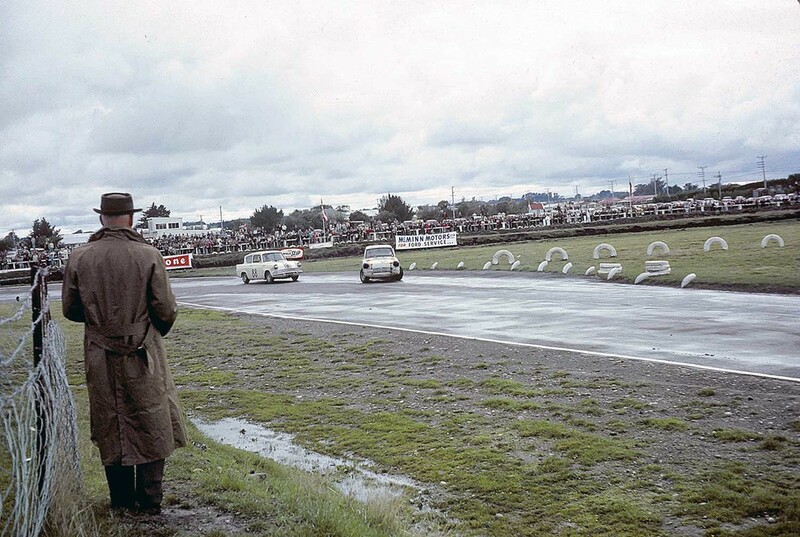 But perhaps the most significant event of 1956 was that held one week after the NZIGP at New Zealand’s first purpose-built permanent motorsport circuit in Levin. The tiny Levin track was constructed inside the local horse-racing track and was the brainchild of local resident Ron Frost, who would later be president of MotorSport New Zealand (then known as the Association of New Zealand Car Clubs) from 1958 till 1977. Frost was hands-on in the creation of the track, driving one of the bulldozers and shovelling dirt. At the time, Frost was racing a 500cc Cooper Norton single-seater, one of many such cars racing in New Zealand. The tiny Levin track was perfect for these machines. The first Levin event attracted 15,000 spectators and an international cast of drivers, despite the fact that the track had yet to be paved. Levin pointed the way towards the future, becoming a mainstay on the New Zealand motorsport calendar, and, in 1958, being included as part of the International Series. But although new purpose-built tracks began appearing elsewhere — such as Teretonga in 1958 and Pukekohe in 1963 — there remained a need for temporary tracks to cope with the huge interest now enjoyed by motorsport. During the late 1950s and 1960s, temporary street layouts were created in places such as Waimate, Mount Maunganui, Timaru, Paritutu in New Plymouth, and the small South Island town of Renwick, in addition to a further two new layouts in Dunedin. On December 3, 1967, two new purpose-built racetracks officially held their first events: Bay Park in Mount Maunganui and Levels Raceway near Timaru. Bay Park was actually due to hold its opening event a week earlier, but heavy rain caused a postponement. The Bay Park circuit included a fairly basic 2.14km layout that utilized just four corners, including a fast sweeper connecting the start/finish straight and the longer back straight. In the early 1970s, a speedway was built inside the circuit racing track. Prior to Bay Park’s creation, Joseph Pierce, his son Graham, and Feo Stanton had organized the temporary Mount Maunganui street track, which included having to tarseal over a section of railway line in order to hold the racing. The tarseal would have to be removed following the racing so trains could operate the following morning. In late 1967, a lease was signed on a piece of swampland bordering Maranui Street and the main Tauranga–Rotorua highway. Also part of the lease-signing were Ian Rorison (Graham’s cousin) and Maketu Contractors. Rorison was a truck and transport operator, while Maketu Contractors was in the roading business. Initially, Feo Stanton was the promoter, but he remained only briefly and was replaced by a couple more temporary promoters until the larger-than-life Peter Hanna took over. Hanna remained in the position until the track eventually closed in 1995. Bay Park was generally run as an outsiders track and tended not to conform to the wishes of MotorSport New Zealand. As a result, it was often left out in the cold when the international single-seater teams and drivers arrived in New Zealand each year for the annual Tasman Series, but this mattered not, as Bay Park had its own agenda. It created its own niche by importing international sedan teams to race the best locals. Despite what MotorSport New Zealand may have believed, punters wanted to see big-banger V8 sedans racing, and Bay Park was very clever at bringing across some of the best international drivers from Australia, the US, and the UK. The crowd numbers backed up this move. Of the 10 purpose-built New Zealand racetracks constructed over the past 60 years — Pukekohe, Hampton Downs, Bay Park, Taupo, Manfeild, Levin, Ruapuna, Levels, Highlands Park, and Teretonga — only two have gone: Bay Park and Levin. Levin closed in 1975. Its days were numbered when Manfeild opened just 30 minutes up the road, near Feilding. The Levin layout was small, with no possibility for expansion. By 1974, V8-powered Formula 5000 single-seaters were lapping Levin in the low 43-second bracket. Motorsport had largely outgrown the track, with cars becoming too big and fast for it. Further, local residents had tired of the noise and had lobbied for years to have the track closed. Remember — in 1975, race cars wore open exhausts, and the Levin track was right smack in the centre of town. I visited the track about 10 years ago, while passing through Levin. I walked into the centre of the horse track, where the car track had once been, and it was possible to see parts of the layout, as the grass had grown slightly differently in those areas. Bay Park closed in 1995. It featured a number of firsts for New Zealand motorsport, including being the first track to host Formula 5000 cars and the first to host truck racing. What killed Bay Park was the ever-encroaching housing, and the consequent increase in its land value along with the increase in rates. In the end, the rates became too expensive. When it was first opened, Bay Park was in the middle of nowhere. Today, the land it was on is occupied by houses. A year after Bay Park closed, its colourful promoter, Peter Hanna, passed away. For those who raced there, Bay Park was a special place, with a special character.